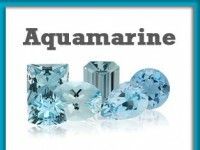 March has two birthstones the aquamarine, which is more popularly know, and the bloodstone. Aquamarines vary in color from deep blue to blue-green of different intensities caused by traces of iron in the beryl crystal. Naturally occurring deep blue stones are the most prized because they are the most rare. Yellow beryl stones can be heated to change them to blue aquamarines. Due to the meaning of aqua “water” and “mare” meaning sea, Aquamarines are said to be the sailors’ gem promising prosperous and safe voyages. Bloodstone is a form of quartz. It is also called chalcedony. Green chalcedony spotted with red flecks is known as blood stone. Bloodstone is found embedded in rocks, or as pebbles in riverbeds. According to legend, bloodstone was believed to have formed during the crucifixion of Christ. A Roman soldier thrust his spear into Christ’s side and drops of blood fell on some pieces of dark green jasper laying at the foot of the cross, and the bloodstone was created.